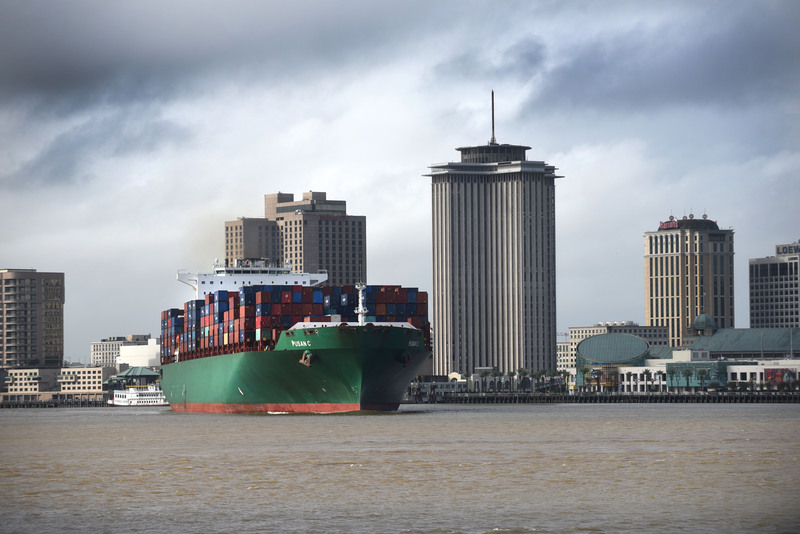 The U.S. Army Corps of Engineers’ decision to deepen the Mississippi River Ship Channel will expand the Port of New Orleans’ (Port NOLA) critical role of serving as a gateway that connects inland markets in America’s heartland and Canada to the rest of the world. The Corps signed a final economic justification report in August 2018, amid strong support from elected officials and industry leaders to increase the channel’s depth to 50 feet, the same depth of the expanded Panama Canal, from the Gulf of Mexico upriver 256 miles to the Port of Greater Baton Rouge. The current ship channel is maintained to 45 feet. The decision clears the way to ensure larger ships can access ports on the Lower Mississippi River and positions Port NOLA ahead of other Mississippi Gulf ports. The project will position the Port to handle growing container volumes at Port NOLA’s Napoleon Avenue Container Terminal which handled more than 500,000 TEU’s (twenty-foot equivalent units) for three consecutive years. Port NOLA anticipates approaching 600,000 TEU’s in 2018 and expects to exceed that volume in 2019. To handle demand and planning for the long term, the Port complex will benefit from a second and complimentary container terminal. Port NOLA officials are evaluating a priority site in neighboring St. Bernard Parish for its ability to accommodate container operations for all three ocean carrier alliances and vessels of any size. The New Orleans Public Belt Railroad will also benefit from a deeper river as volumes would likely rise with increased activity at the Napoleon Avenue and secondary container terminals. Port NOLA is one of five ports located on the Lower Mississippi River, which combined move more than 500 million tons of cargo, including 60 percent of the nation’s grain. The project is expected to create 17,000 jobs as a result of the increase in production and $849.5 million in increased income for American workers, according to a study co-sponsored by the Big River Coalition and the Louisiana Department of Transportation and Development. The Corps’ report identified the benefit-to-cost ratio at 7.2 to 1, calling the project one of national and international significance. The federal share of the project would be $118.1 million, while the estimated non-federal share would be $39.4 million. The Corps also stated the project is environmentally sustainable as material dredged from thirty miles of the project near the mouth of the river will be used to create an estimated 1,462 acres of new marsh habitat.